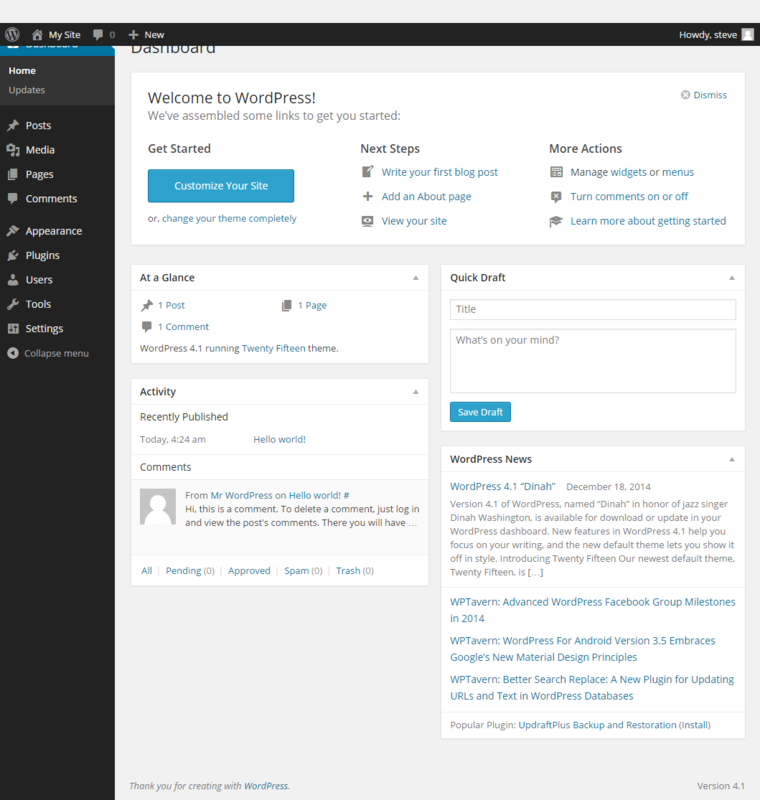 Wordpress is a great tool for building web sites. It's been around for a long time and has a lot of useful features. Wordpress is very popular, so there are a huge number of plugins and themes available for it. Many of them are free, but some of the more sophisticated add-ons are commercial. The range of plugins covers everything from performance optimization to social networking and e-commerce. 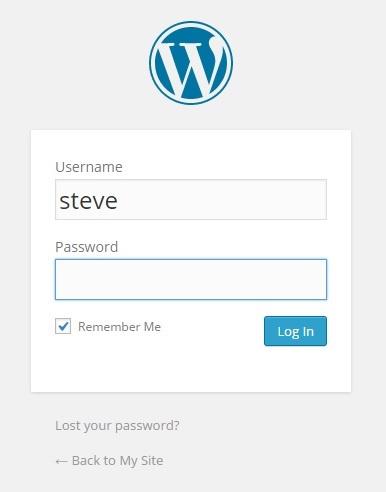 To install Wordpress, set up your server as a LAMP server and install Apache, MySQL and PHP. 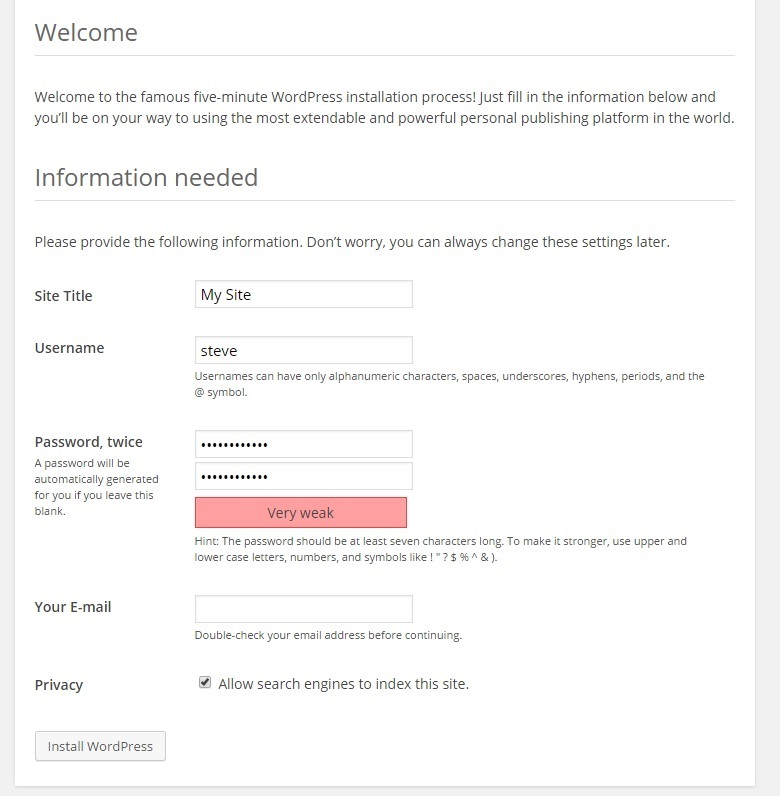 The first command creates the database, and the second one creates a user account that can be used by Wordpress. The new account is granted access privileges on the new database. The privileges table needs to be flushed, and then you can exit from the MySQL client shell. Near the top of this file you'll see definitions of the database name, database user name, and the database password. Change these values to match the database name, user name and password that you stored in the database earlier. Type control-o and press return to save changes. Type control-x to exit nano. Take some time to look around the dashboard. You can change your site's theme in the Appearance menu, and adjust options in the settings menu. Consider adding plugins to your Wordpress installation to improve performance. Wordpress is a large piece of software, so it's worth adding a caching plugin to speed up page load times. WP Super Cache is a popular choice. The Google XML Sitemap plugin generates an XML sitemap which you can register with Google. Visit the Wordpress site to see some of the most popular plugins. For security reasons it's bad practice for Apache to have permission to write to files and directories in the web root directory. If Apache is hijacked by hackers, and it has write access to the web root directory, then hackers will be able to modify content on the site. Instead, files should be owned by root, and be readable by other users, but not writable. This can be a problem when you're setting up a Wordpress site, and you need to install plugins and themes since Apache needs to be able to store files in the web root directory. A simple solution is to change the owner of Wordpress's files to www-data during development, and then change the owner back to root when the site is live.